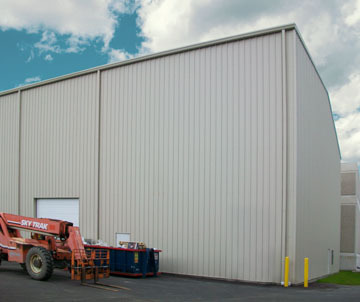 RHINO prefabricated steel industrial buildings provide nearly limitless applications for manufacturing facilities, warehouses, welding shops, meat packing plants, processing plants, recycling centers, saw mills and lumber yards, aircraft hangars, truck terminals, oil and gas buildings, equipment storage, industrial parks, and more. Each RHINO rigid-frame steel building can be customized to fit the requirements for your industrial building construction. Affordability: RHINO steel industrial buildings provide an overall greater cost effectiveness than competitors. RHINO Steel Building Systems are built to exacting standards and include many standard features and waterproofing benefits only offered as options by other companies. Durability: Our steel industrial buildings are built to last, while retaining their strength and value for decades. Industrial buildings can be both functional and attractive, with colorful, durable, maintenance-free PBR (purlin bearing rib) steel panel exteriors. Brick, stone, stucco, glass, or tilt-up concrete exteriors can be used on a RHINO steel building if required. Clearspan: RHINO’s rigid frame steel framing is so strong it can span much wider areas without interior support columns. That allows owners more flexibility during industrial building construction. RHINO buildings can span up to 150’ in width without any interior supports on a standard order; custom designs can clearspan up to 200’ in width. Widths up to 480’ are possible with a load-bearing center column. RHINO buildings can be any length you need. Building heights up to 40’ are standard. Even higher buildings are possible with a custom quote. Plans can also include mezzanines, if desired. Options: RHINO steel industrial buildings can be designed with extra loads for sprinkler systems, ceiling cranes, or any other specialized industrial requirements. See our Metal Building Options page for more details and other options available for industrial building construction including skylights and overhead doors. See the Pro-Value Options for money-saving, energy-efficient insulation options. Call today! Our team of experienced steel building specialists are ready to assist you with your industrial construction project. Call 940.383.9566 for a free consultation. Share the post "Steel Industrial Buildings"